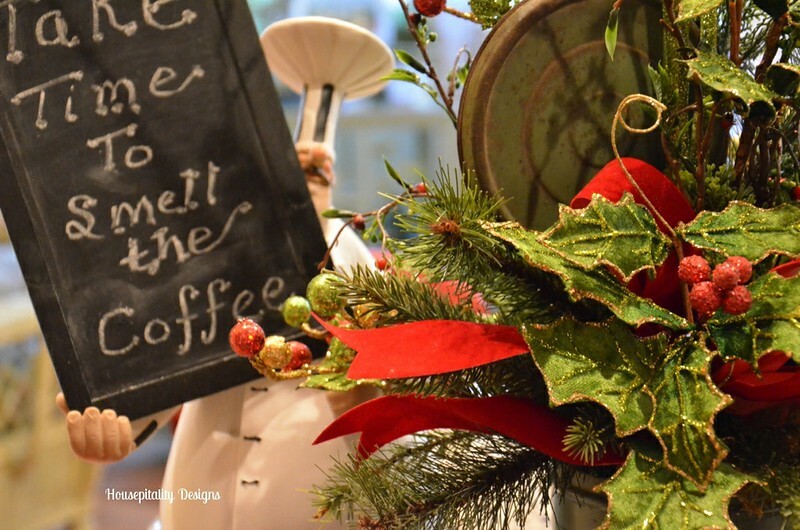 I will be very busy this week making Christmas wreaths and holiday arrangements…. …..for our neighborhood Annual Craft/Artisan Show. 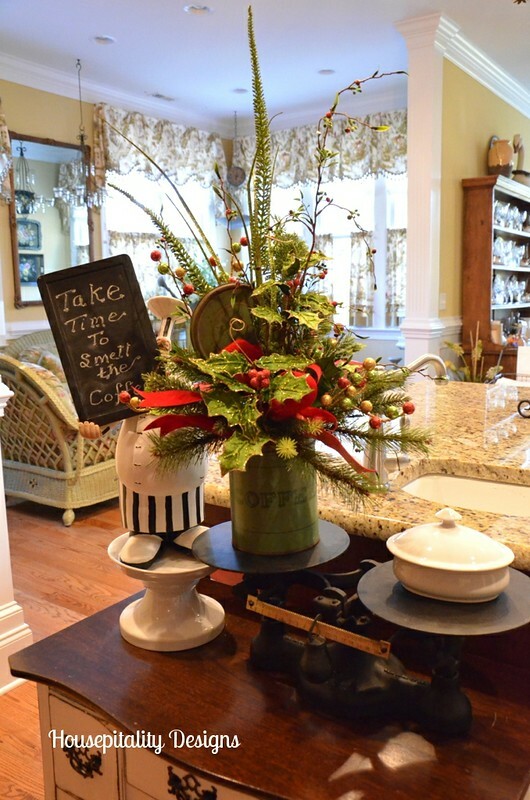 I worked on this arrangement yesterday…..
…..in-between creating my Thankful At Home table. 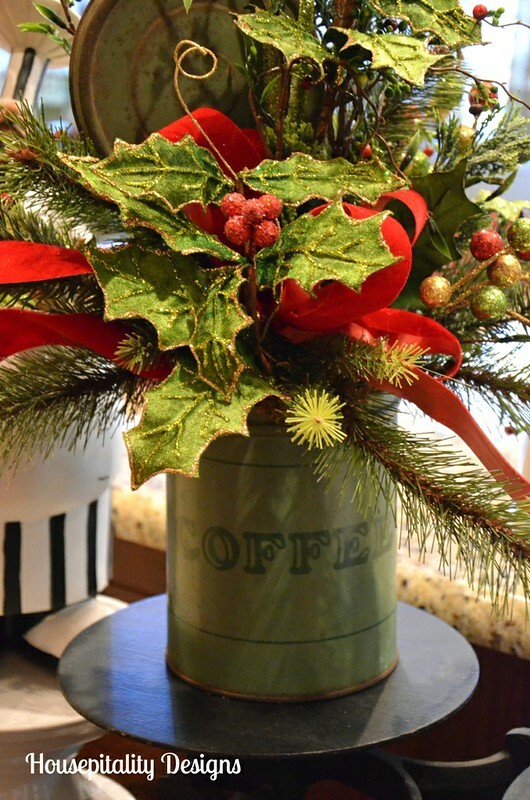 I am making Christmas arrangements using vintage containers, like this coffee tin. I feel any faux floral arrangements look so much better…. …..in a very interesting and sometimes “out of the box” container. 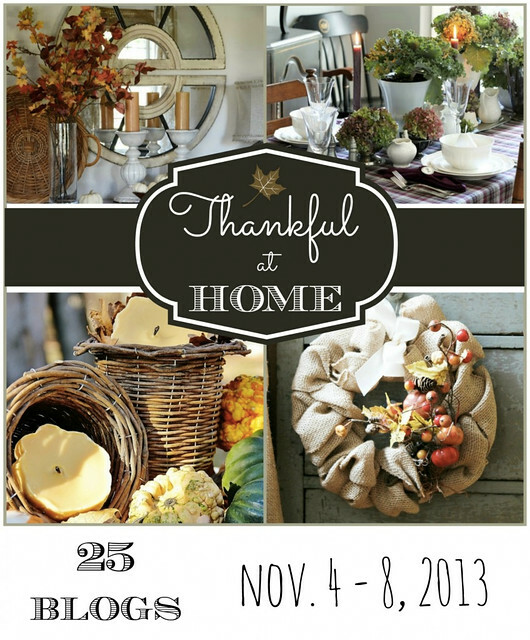 Day One of the Thankful At Home Party starts today…. There will be five days of great inspiration. I hate to be the bearer of bad news but….that is going to sell. Uhh yeah, kiss it goodbye. It’s stunning! Oh that’s definitely going to sell! I agree with you about creating things with faux materials, the more unusual and unique the better! Have fun with the neighborhood show! Your Christmas arrangement is lovely and I adore that it is in a unique container. I don’t think you will be bringing that back with you. It is stunning, Shirley. Where is the sale – and when? I think I would have a hard time letting that one go, Shirley! Beautiful! Can’t wait to see what you share on the tour! I used to do this every Fall. We would sell things at craft shows and at a pumpkin patch. Lots of work, but fun. If I were there, I would definitely buy your coffee canister arrangement. It is wonderful! Beautiful arrangement and I think you will not be bringing this home – it will sell right away. Can hardly wait to see you on the tour. Have a great day and good luck with your fair. I think it will sell quickly. I love the vintage tin. Great job, Shirley. I just had a dejavu moment. Remember the floral arranging class we took together? You got an A and I got a C. LOL If it doesn’t sell you can send it to your flunky friend in Colorado. I forgot about that. That was one sharp knife. I still have it but am afraid to use it! Shirley this is beautiful, you did such a great job and I really love the container you chose. I have to believe this will fly off the display quickly! I agree, this will definitely sell, and I would be fighting my way to the front of the queue if I was there! Tracey Steele’s recent post…Aldbury Nowers Ghosts. I am sure it will sell! Wow, you have honed your skills and that is a beautiful arrangement! Just gorgeous. Nana Diana’s recent post…I Won ANOTHER Giveaway! Shirley, I really love your coffee tin and the arrangement you put together-great job! Oh Shirley I think that may just sell quickly. Just gorgeous. You better make another one! Shirley, this is so cute! I love the coffee container; what a great choice! I ‘m sure it will sell because you have made it a fabulous piece for a vintage Christmas! Another great arrangement, Shirley! Love the touch of red here and that container is perfect for this arrangement. I LOVE that arrangement and that it’s in a coffee canister! Too bad you didn’t live in Chicago, I totally would have purchased it as a gift for a friend that is sure to love it as much as I do! And I do love that scale on which you have the arrangement displayed! 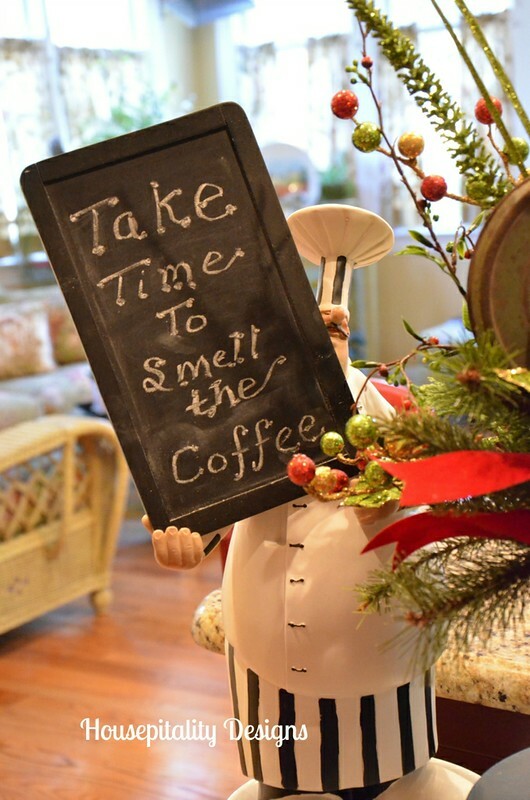 Your home decor is always so much fun! I like your ideas. I think vintage containers make the best arrangements. 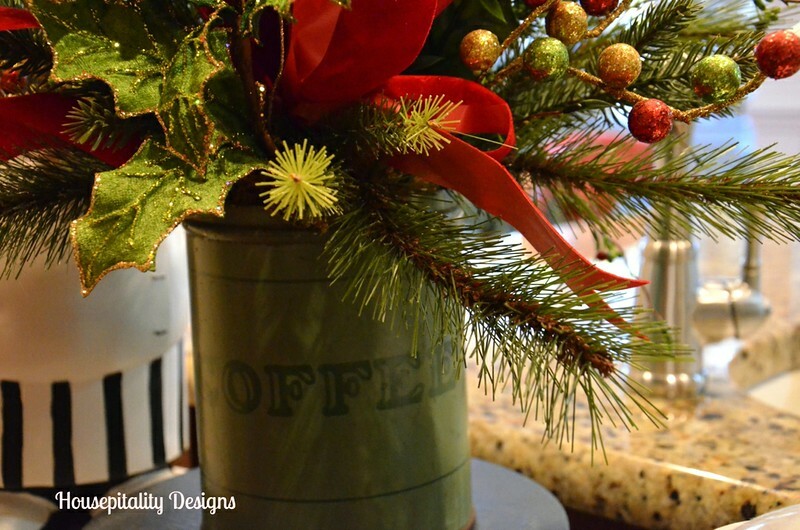 Love your vintage coffee container for a floral arrangement Shirley! LOVE IT Shirley…I know that won’t last too long!